Almost catching air at the 2017 ESA Championships. Somehow the organizers of the Eastern Surf Association (ESA) Championships managed to get two days of competition into one on Sunday. And a good thing they did because surf conditions today are horrible—a classic example of being blown out. Onshore winds from the northeast 25-30 with stronger gusts; waves 7-10’, although that’s tough to tell because the surf is so churned up it’s hard to know where the waves are. It’s all thanks to Hurricane Jose as it passes the Outer Banks well out to sea. As hurricanes go, Jose is not a particularly powerful one, but it has been spreading out as it loses focus so the effects are fairly widespread. The ESAs—which is the shorthand way to describe the championships—are held every year at Jennette’s Pier in Nags Head. In years past there have been some challenging conditions, but this year seems to be taking that to extremes. Even Sunday, when two days of surfing was mashed into one day of competition, finding any wave to ride was a challenge. The ESA competitors got their rides in, but it was an exhausting day for many of them. Because conditions were so difficult, in many cases, surfers rode their wave to shore, ran down the beach and paddled back out. 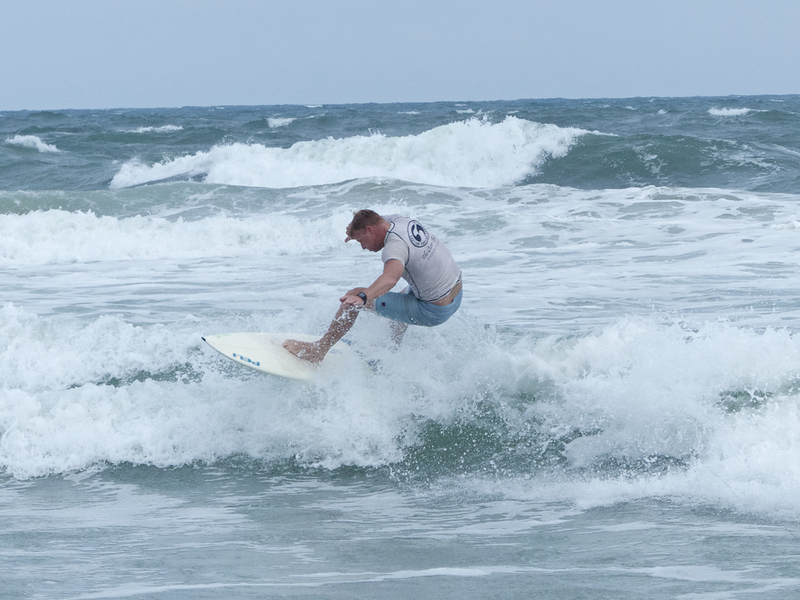 Even though this is an amateur competition, there were some really good surfers on the water, but many of the classic surfing moves were not happening in those conditions. With waves breaking left, right and in the middle—sometimes simultaneously—there wasn’t much opportunity to catch air. And there wasn’t a barrel wave all day. They’re hoping to restart the competition tomorrow, although whether that happens is till up in the air. The winds will be dying down and shifting to northwest and west, which is a good wind direction for Outer Banks surf. However, some of the biggest surf we’ve seen yet is forecast for tomorrow with wave topping out at 10’ and maybe a bit more. After Tuesday, the rest of the week looks to have excellent conditions.